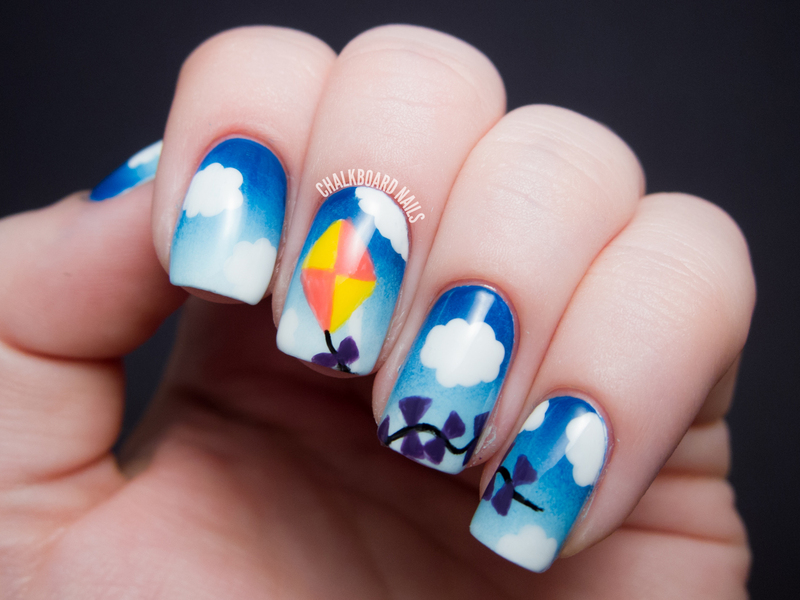 Nail art is my favorite thing in the world, but I'll admit that it can be time consuming and sometimes frustrating. 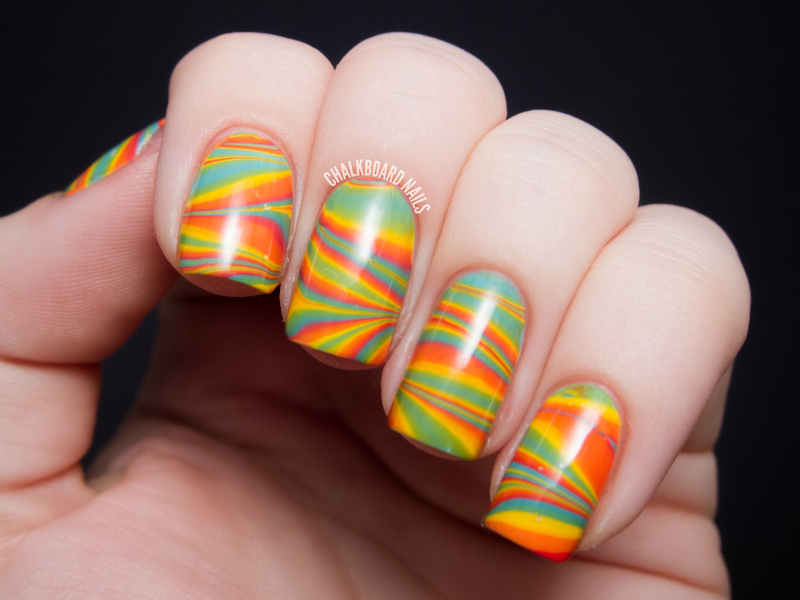 Sometimes you wanna jazz up that manicure but don't wanna spend a ton of time on nail art. 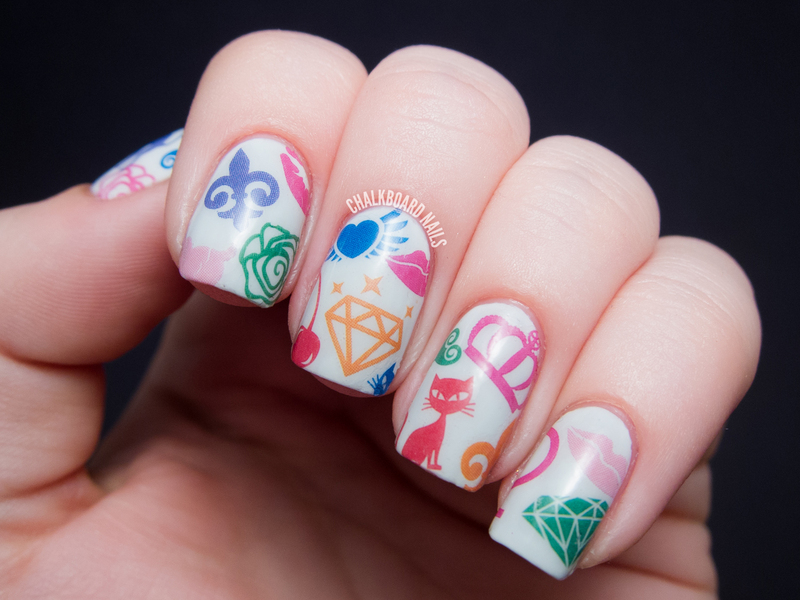 ENTER BIGRUBY NAIL TATTOOS! 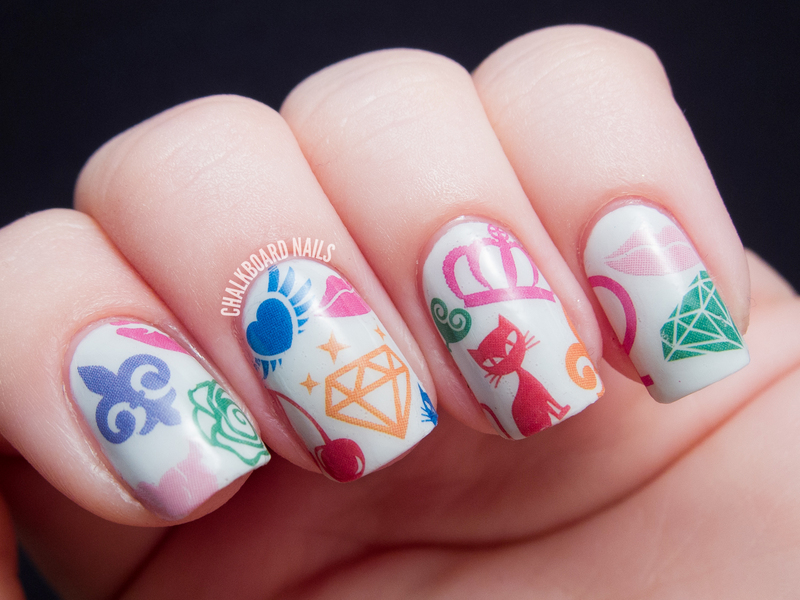 These nail tattoos are easy, fun, and sassy. The designs are awesome -- I couldn't pick just one! So I jammed a bunch of them together. Not sure what to call it though... graffiti nails? Collage art? Clipart manicure? What do you think? 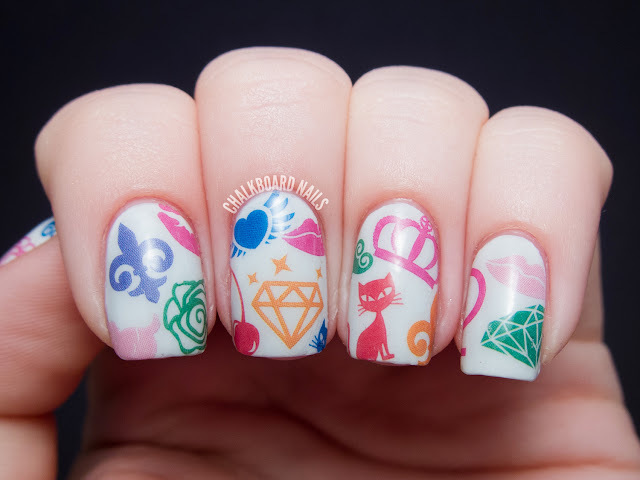 These nail tattoos are very similar to the temporary tattoos that you probably used as a kid. The process is simple! Apply your base polish and let it dry completely. Cut the tattoo you want to use out of the sheet. Remove the clear top sheet. Press the tattoo (image side down) on to your nail. BigRuby makes it easy to place these where you want them because they have the image reprinted on the back side of the sheet! Wet the back of the tattoo and press down for 15 seconds. Remove the paper. Smooth your tattoo out (if needed) with a wet finger. Let dry and finish with two coats of topcoat. Even that makes it seem more complicated than it is though -- basically the steps are cut, stick, wet, smooth, and finish. I used OPI My Boyfriend Scales Walls as the base polish, and all of these tattoos came from the "Hers" tattoo set. BigRuby also offers a bunch more tattoo pack themes like "His," "Sea," "Garden," and "Juju," among others! Obviously I piled a TON of tattoos on my nails, but you could use one or two as an accent if you want a simpler manicure. I actually have a couple of looks saved up that only use single tattoos, but I just couldn't wait to share this crazy one with you. Overall I was very pleased with the experience I had using these tattoos. 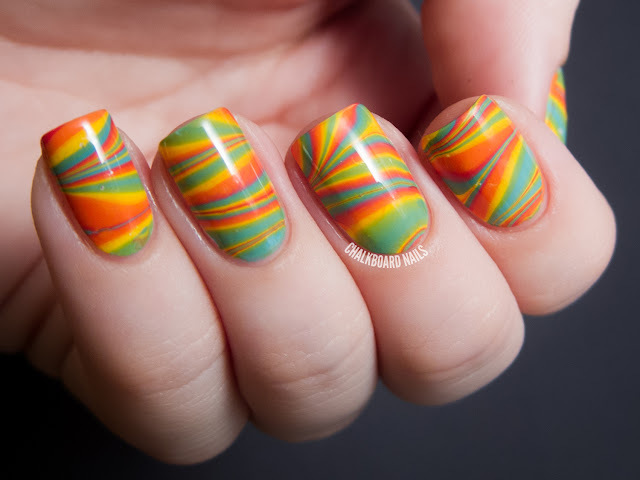 They were easy to apply, are well designed, and look beautiful on the nail. Each pack of tattoos comes with two sheets so they are sure to last you a while. You can buy bigRuby tattoos on www.bigrubytattoos.com. Each pack retails for $12, though they have a few packs on sale right now, too! You can also find the brand on Twitter. The other day I was desperately in need of a mani change, but I was a little short on time. What to do? Grab a matte, of course! 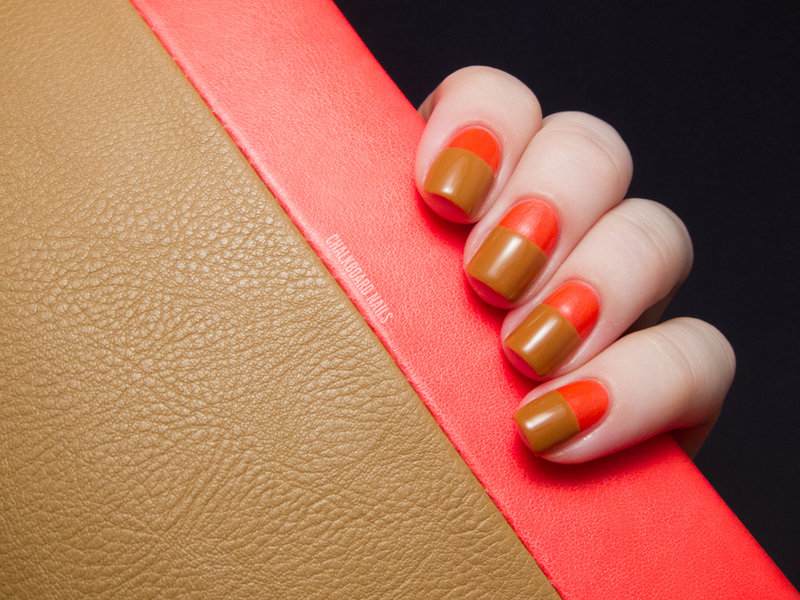 Mattes are great because they usually require very few coats and dry quickly. Plus, they look awesome, but that one is kind of a given. 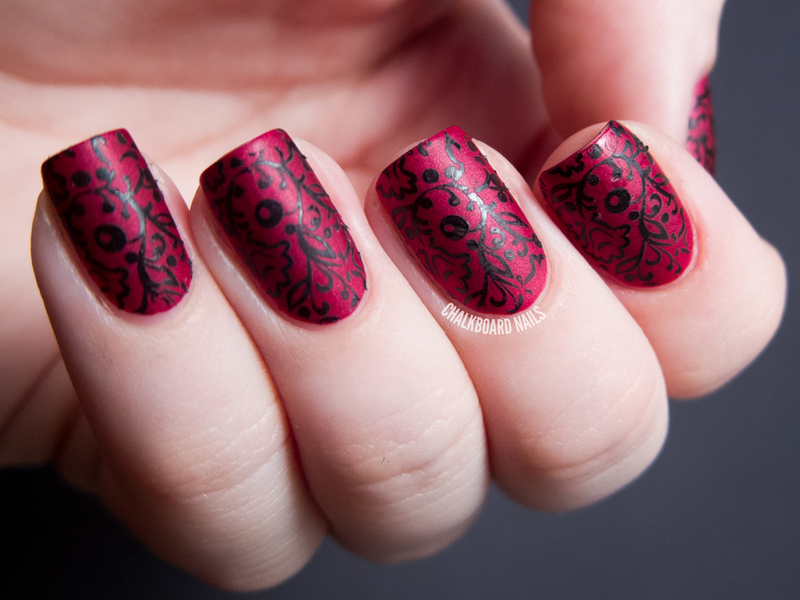 I wore Zoya Posh for the evening, and then later decided to embellish it a little bit. I did something unexpected... I STAMPED! Can you believe it? 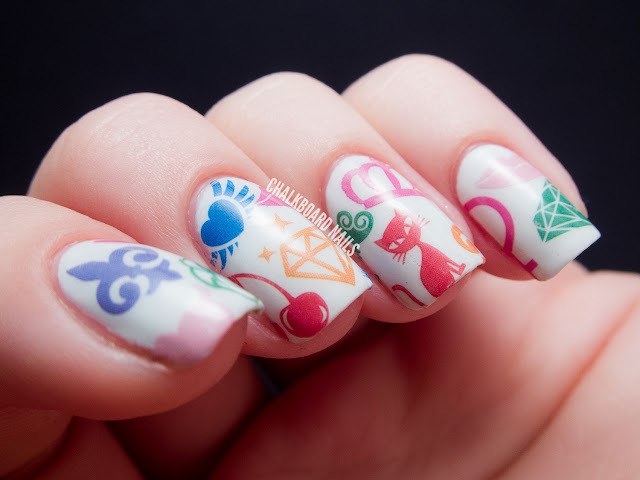 I think I only have seven stamping posts since I started this blog. I used an image from the Nailz Craze plate NC03. It was a gift from my dearest Michelle from Sonoma Nail Art, how sweet is she? There are some adorable designs on this plate; I definitely want to try out the matryoshka (nesting doll) image. I stamped the image using Sally Hansen Night Flight. Here is the entire look with the original matte finish. Then, of course, I had to see what it looked like topcoated! As much as I want to prefer the matte look, I think I like this best with topcoat. 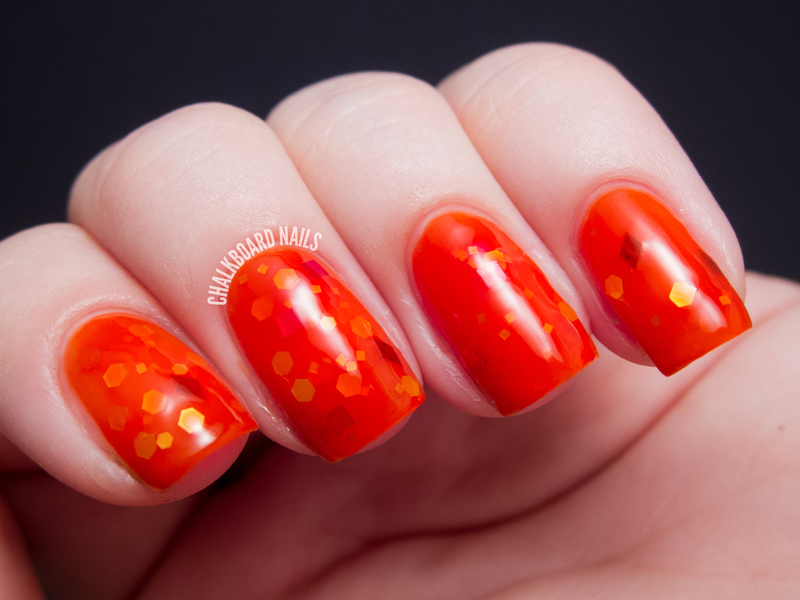 The shimmer in Zoya Posh becomes glowier, and the stamping becomes clearer and darker. Plus who can resist the high-gloss shine of Seche Vite? No one I say!! Which way do you prefer this manicure? Matte or glossy? Zoya Posh is an older shade that is unfortunately not on the Zoya website anymore. You may have some luck finding someone to swap for it or picking it up from a blog sale. 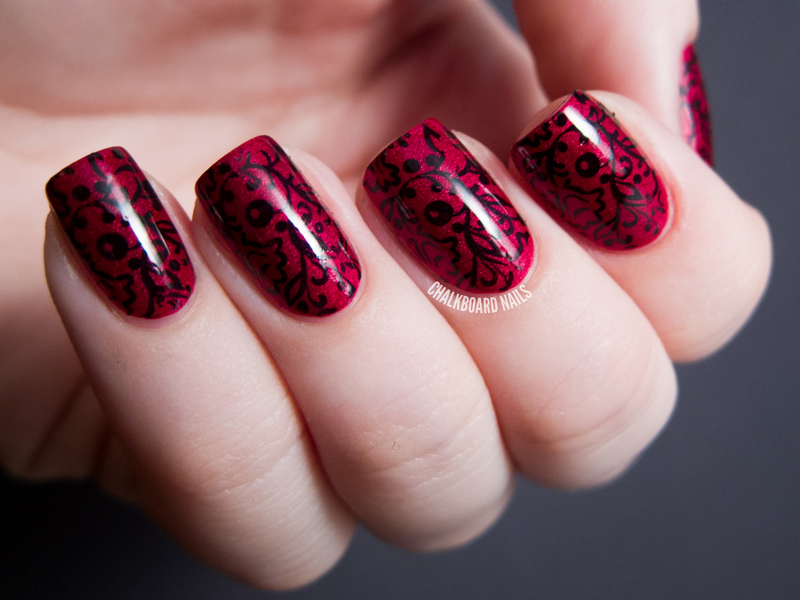 Alternatively, you could get a pretty red and add a matte topcoat (like Essie - Matte About You). Nailz Craze plates are sold in the Nailz Craze Etsy shop. You can also find the brand on Facebook. I'm kind of having a kite moment. 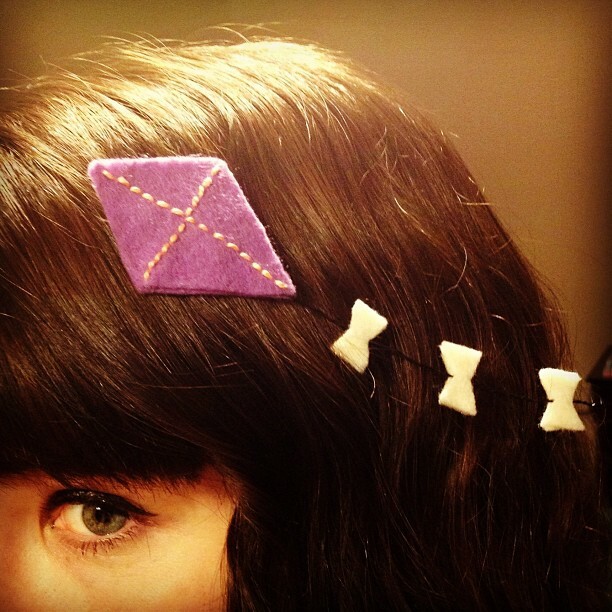 It all began when I ran across this amazing kite hairclip tutorial on Wild Olive. I made one myself with a few modifications... it was so easy and was almost too cute for words! I ended up making a few more for family and friends, too. 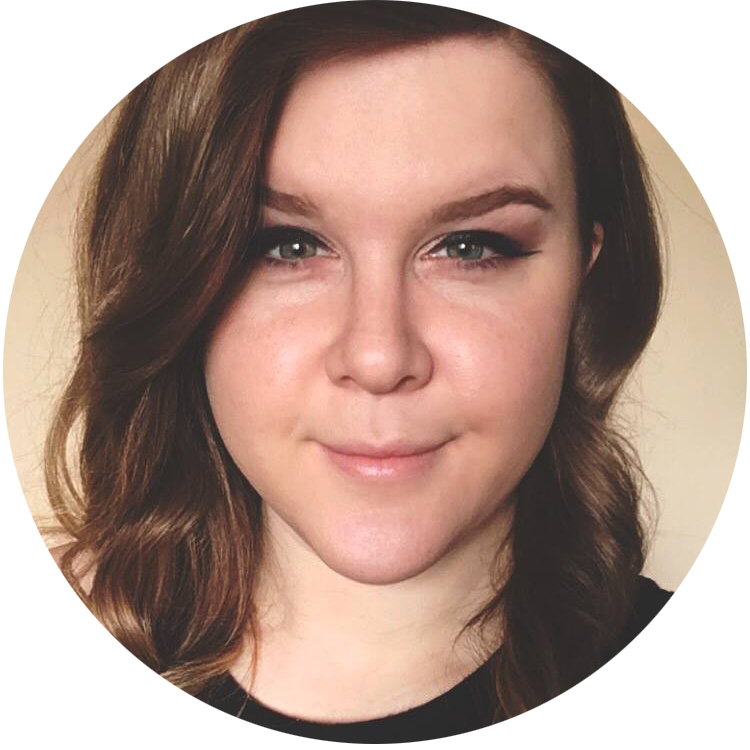 You can check out some photos of those at the end of the post if you're interested! 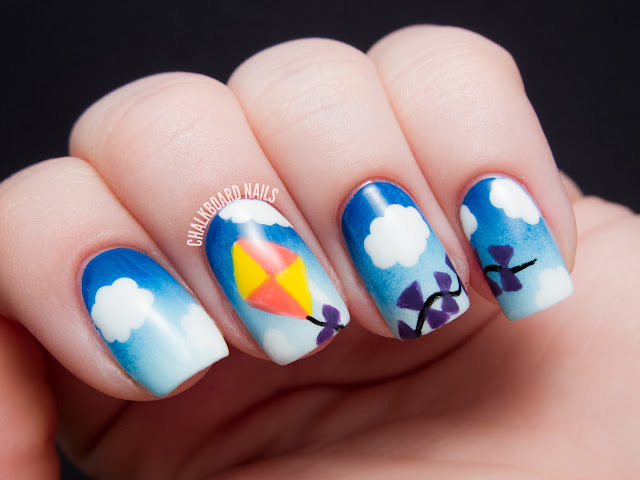 Kites are so classic and youthful, and yet sort of romantic and idyllic... 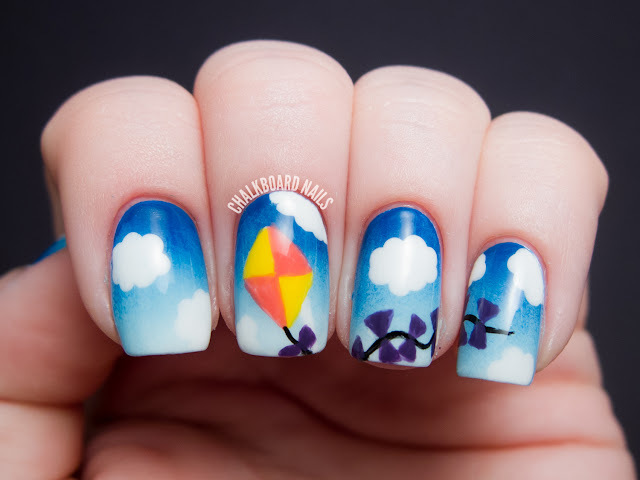 I knew I had to do some cheerful kite nail art, too! I started by sponging on a gradient of DIOSA I Sea You, Sally Hansen Blue-Away, and Zoya Purity for the sky. 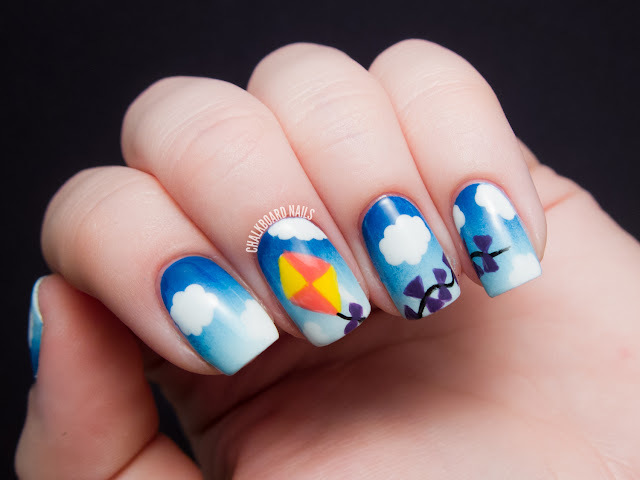 Next I painted a kite shape in white on my middle finger. After putting down the white base, I added the yellow and pink sections using Zoya Darcy and Zoya Micky. The final step in creating the kite was a black tail and purple bows done in OPI Funky Dunkey. 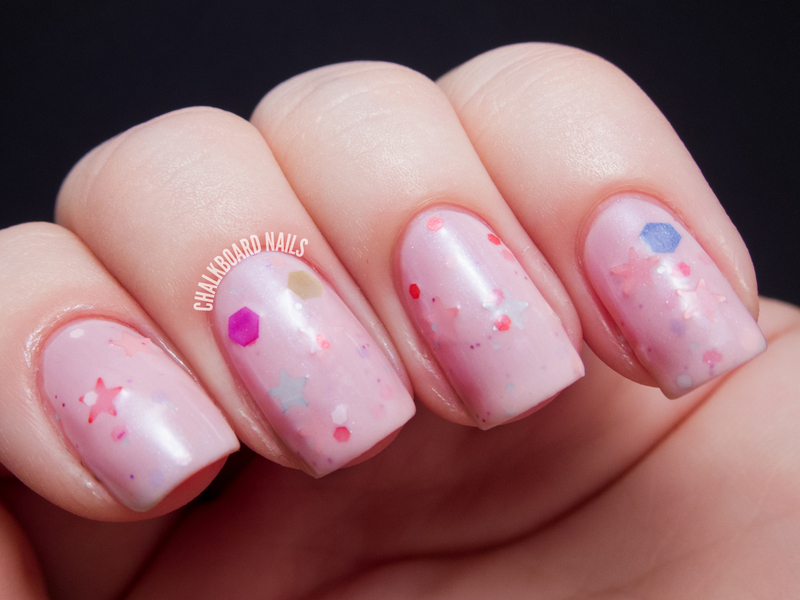 As a finishing touch, I used a dotting tool to make some cute fluffy white clouds. The manicure was pretty easy overall -- the most challenging part was painting a thin line for the tail and keeping the bows small. So what do you think... does this make you want to dig a kite out from the depths of the garage and take it flying? I know I want to! I don't think I've flown a kite since I was a little girl. 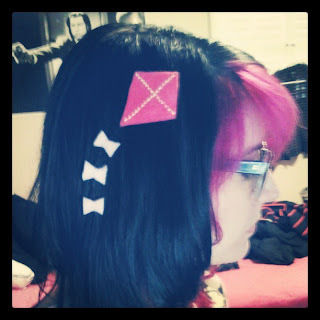 Here are the kite clips that I made using the Wild Olive tutorial! The first one is Dayna's and the second is mine. 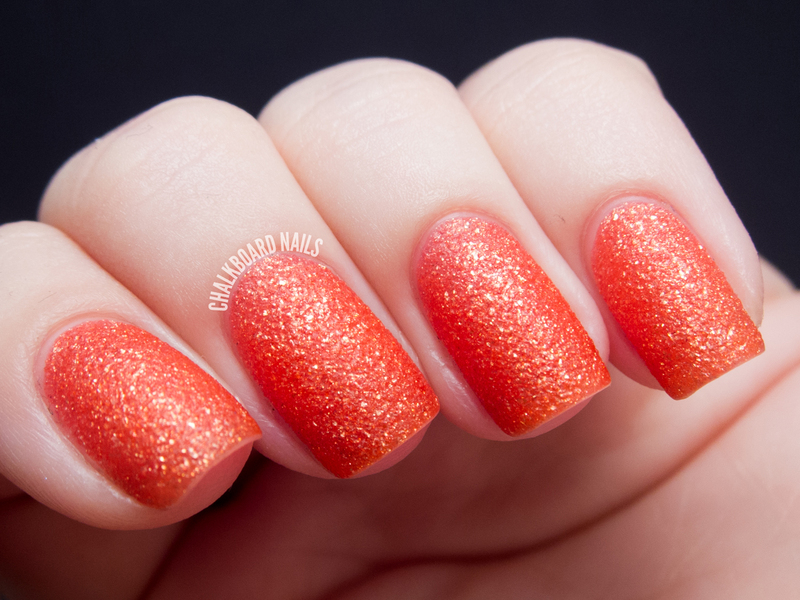 Zoya is really pumping out the collections lately, not that any of us are complaining! One of their latest is the Stunning Collection, which is made up of six creme finish polishes. I had them all lined up together on my table and thought they looked beautiful together, and decided to incorporate them into a water marble. 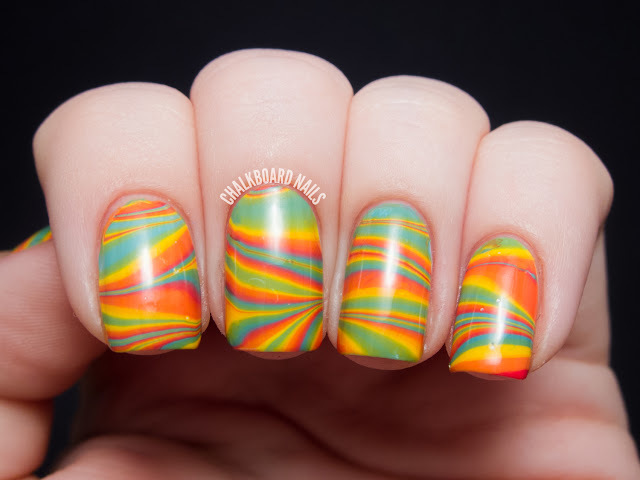 I used five of the six polishes in the collection for this look: Yana (pink-red), Thandie (orange), Darcy (yellow), Josie (green), and Rocky (blue). There is also a coral called Micky in the collection but I was worried it was too close to Yana to be distinct enough in the marble, and chose to not include it. As I was marbling I realized something...although I was dropping the polishes into the water in rainbow order, some of them were blending into each other! Yana and Thandie seemed to merge together and come out orange, while Josie and Rocky just looked green next to each other. 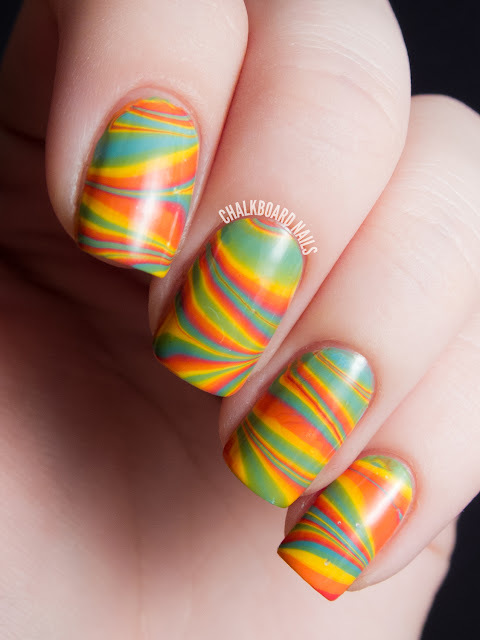 This marble pattern is a new one for me! I've never tried this line-type effect and am really happy with the way it came out. Colette has a tutorial for a similar look, except I stopped before the final swirl she does through the water. Water marbling is still challenging for me, but I've come a long way since the first time I tried it a year and a half ago. Just goes to show that persistence pays off! So, what do you guys think? 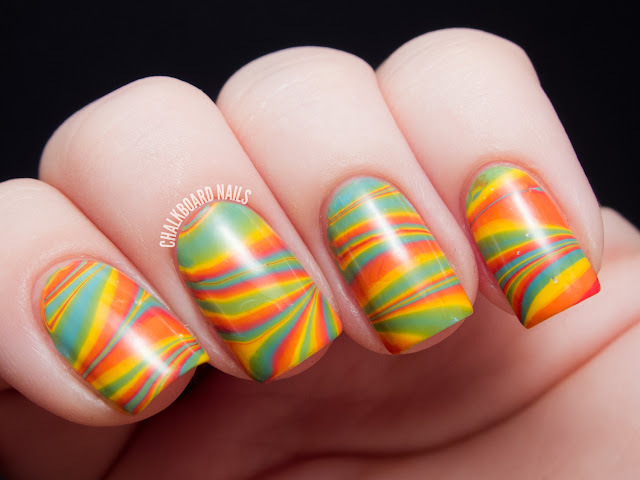 I love this look, it's summery and bright and mouth-wateringly sour. The Zoya Stunning Collection is available now on Zoya.com. Each polish retails for $8. Contrary Polish is releasing a new trio called "Ain't That a Beach" and it is made up of three polishes: Sand, Sky, and Surf! 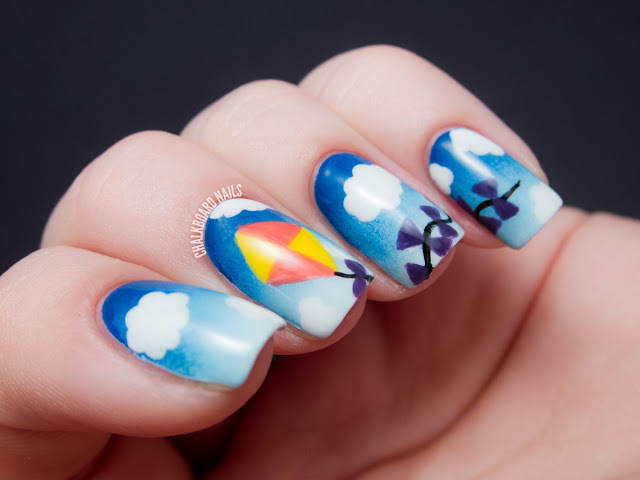 These polishes are sure to conjure up memories of relaxing afternoons at the beach. Each polish is shown first in indirect light and second in direct light. Sand is a dirty tan with gold shimmer and brown microglitter. I think this gorgeous neutral is my favorite in the trio! It truly does look like wet sand. I need to do some beach nail art on top of this one... maybe some shells, a footprint or two... 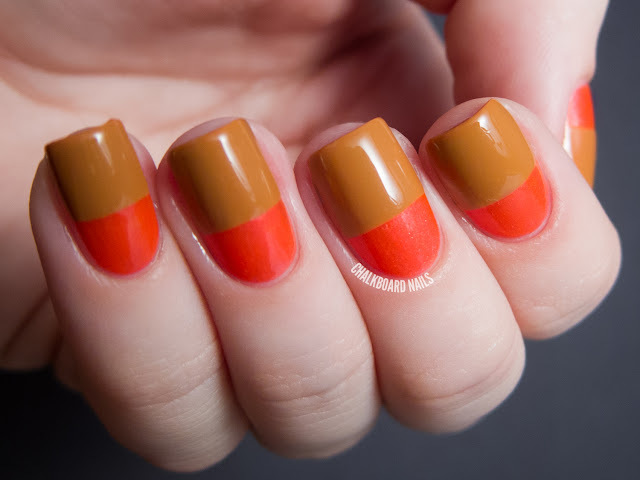 The formula was excellent and needed two coats for the swatch below. Sky is a lovely deep sky blue with gold shimmer. This is a great great summer shade! Two coats. Surf is a dark green-leaning blue with green-teal shimmer. It's kind of deep and moody without being overbearing. The green shimmer is the perfect accent to the base color. Two coats. I know I say this every time I review Contrary Polish products, but the formula is fantastic as usual. 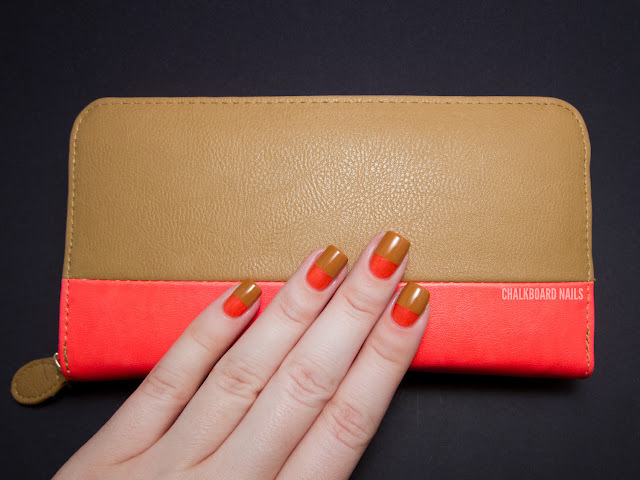 Creamy and buttery, it applies smoothly to the nail without issues. 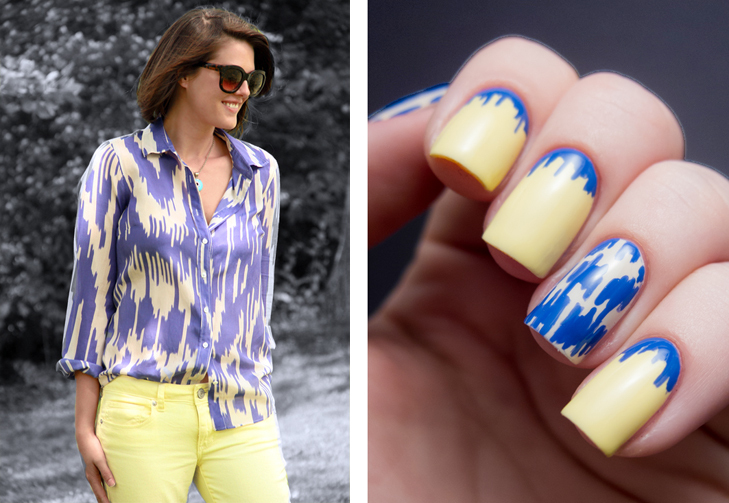 Are these polishes transporting you to a beach vacation? My favorite is Sand -- Carrie nailed the inspiration! The Ain't That a Beach trio is scheduled to be released this afternoon at 1:00pm MST on Llarowe (ships internationally!). The polishes will retail for $11 each. Carrie also sells minis of her polishes on the Contrary Polish blog, though I'm not sure if or when this particular trio will be available for purchase. I'm constantly on the hunt for ways to improve Chalkboard Nails for the both of us, and if something makes sense I'll take the plunge! So on that note, I have a couple of administrative things to go over with you guys today. First, you may have noticed that I've switched to Disqus commenting. Recently, I've realized that the Chalkboard Nails comment system could be better serving both of us. Disqus has a lot of advantages over the old system: guest commenting and more comment login options, better replies and reply notifications, image attachment capabilities, nicer mobile support, improved spam detection, and more. I'm asking you guys to give the system a try for a bit and let me know what you think! I honestly believe it is a better fit for the comments here and I hope you do too. Second, I've put together a little survey for you guys to fill out if you have a spare moment. 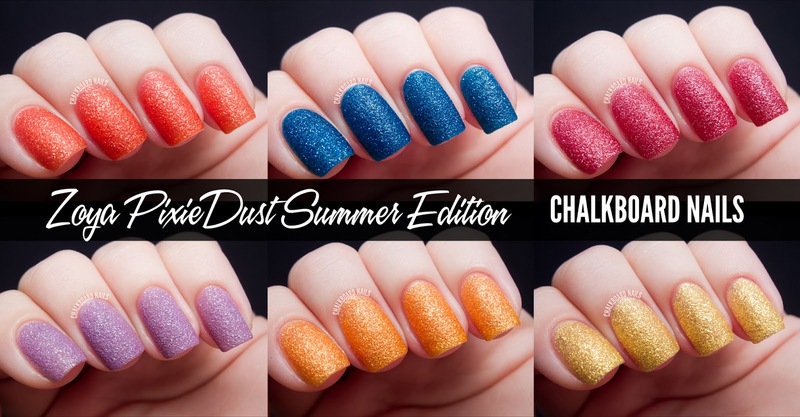 It's basically just questions about how you use Chalkboard Nails, what you like and dislike, what I could be doing better... I'd LOVE to hear your thoughts, and it shouldn't take more than a few minutes. Click here to be taken to the survey directly instead of taking it on this page. I'm collaborating with Jessica from What I Wore for a four part series of nail art designs inspired by her past outfits! Stop by What I Wore to view the first installment, including details on the colors and techniques used.